An inexperienced resume writer thinks the perfect resume is through the usage of fancy words used to promote the applicant to the hiring manager. Many resumes fail because of how polluted the content is, that it becomes almost unreadable. Resume writers who want to start their own resume format should not even think of writing an applicant’s personal portfolio. Hiring managers are strict when it comes to format. A single blunder could destroy the applicant’s chance to land a job let alone, receive a call for an interview. Hiring managers hate it when they flip a resume’s page just to find out what they were looking for was not included. Anything worse than that is a resume writer’s inability to produce his/her client’s summary of qualifications. Hiring managers always look for the applicant’s summary of qualifications first. If it is not present within the resume, chances are he/she will abandon the application and move on with the next. A resume is not a painting canvas. Using unconventional colors to print the applicant’s header text or anything enclosed within the resume is not a standard practice. For amateurs, applying flippant color and designs is a strategic move to get the hiring manager notice the resume. An inexperienced resume writer shuffles the applicant’s data in wild fashion. This is a merely a ruse to keep the hiring manager busy in reading the resume’s discombobulated parts. Though hiring managers read the entire resume, there is no guarantee that the applicant will get a call from the HR department. Finally, a poorly-written resume includes an assortment of self-scathing gimmicks. 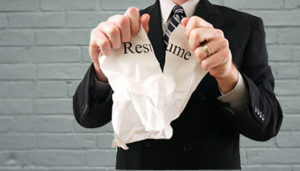 Resumes should not thrive on selling the applicant’s credentials in an incoherent manner. Sticking with the basics help, and amateurs find it hard to follow traditional resume writing disciplines.